If this idiosyncratic cinematic self-portrait is indeed Agnes Varda’s final film, it’s an illuminating and poignant adieu. The Belgian-born octogenarian film-maker ‘walks backwards’ through her life, narrating and drawing on clips from her own films and her treasure trove of photographs and staging reconstructions of her memories, whilst revisiting the places (including the titular beaches) which have shaped her creative output. Originally trained as a photographer, Varda made in 1954, her pioneering debut feature La Pointe Courte which was set in a Mediterranean fishing village near to which she had lived during World War Two. (Here she tracks down two of the surviving members of the cast, who help re-enact a particular scene.) Later she became associated with the Left Bank group of New Wave directors, including Alain Resnais and Chris Marker, and she herself married and collaborated with the great Jacques Demy: her Jacquot de Nantes was a melancholic recreation of the dying Demy’s childhood. Down the decades her work took her to China, Cuba and California, and en route she befriended such stars as Jim Morrison, Jane Birkin and Harrison Ford. What’s so appealing about The Beaches of Agnes is that it’s suffused by its feminist creator’s playfully eccentric spirit, and heads off in all sorts of unexpected directions. 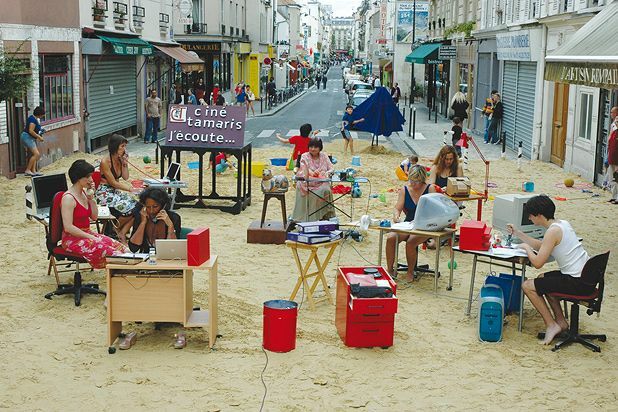 Thus the diminutive Varda pilots a small yellow boat up the Seine and dresses up as a potato during the Venice Biennale, and an all-female production office is constructed on a beach right in the middle of a Parisian street. And look out for her conversations with the reclusive Marker, who appears in the guise of an animated ginger cat Guillaume-en-Egypte. (18) 112 min. General release from Fri 2 Oct.